Congrats to Tessa. She just won a copy of my two new ebooks from the contest! Yay Tessa! I'm following your blog now. Everyone should go and check it out! :) Like me, she's on the agent quest. And I have a new review for those ebook lovers out there. This story is by a fellow Gypsy Shadow Publishing Author, Sheila Deeth. She won the writing prompt, thus winning a contract with GSP. 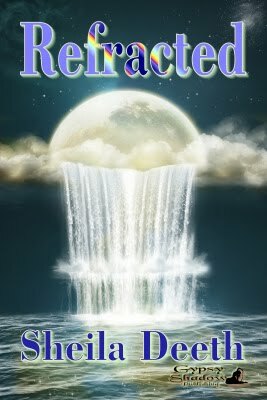 In Refracted, Sheila Deeth weaves together many stories with the underlying themes of rebirth and second chances. With dreamy word building and poetic imagery, she creates a world on the brink of a biblical apocalypse and a boy caught amidst a constantly morphing landscape from a field, to his quilted bed, and then a boat, rocking on tumultuous, monster-filled seas. The entire story feels like a dream sequence, light, airy and mysterious, buoying me up with currents of hope. Congrats, Tessa! Boy, yesterday was your lucky day to win things! Congratulations Tessa. I know you'll love the books. And thank you Aubrie. My first review!